Overcoming adversity, women’s equality, and education. Like my cousins, I was engaged before I was born. I was to be married off at the first sign of my menses. I should have had 5 children by now. But my story changed one day when my 15 year-old father and my 12 year-old mother walked out of my grandparents’ home and started a journey together. It was the hardest thing either one of them could ever dream of doing, leaving all the support of a traditional household of extended family. And it was the most disrespectful thing my father could have done to his father. But it led to good lives for so many in my family—me, my siblings, my cousins, my parents, even my grandparents. My origins are not different, but my opportunities were thanks to the brave decisions of my parents, and that’s what made me who I am. I discuss the many struggles and long journey, of our story out of poverty while empowering others along the way. I am on a mission to redefine honor, because a better definition of honor is the best weapon to fight honor killings. My father is the one who taught me this. When I was little, he sat me on his lap and told me what honor meant to him. It was very different from what I had learned about how good girls honor their fathers. Instead of hiding me from the world and keeping me meek, he taught me that honor comes from working hard, being a good person, preserving your heritage, and achieving great goals. In that single moment he changed my perception of honor forever, and more important, my perception of myself and what I was capable of doing. I realized over time how blindly in the name of honor hundreds of women are abused and murdered around Pakistan. I have made it my goal to change the common notion of honor, to make it about achievement and celebrating our culture with dignity. Because it is the fundamental right of everyone to have dignity, and we do that by redefining honor, by educating our daughters and all our children about how to strive for success and do things that dignify us as humans and nations. I use this teaching in everything I do, but especially in my fight against honor killings because it has required a lot of creative thinking and action to be able to work in communities that commit these atrocities but do not believe there is a problem to be solved. Because when we bring solutions to the table, we don’t waste time by complaining, but instead discover new strategies to fight our problems and then make them happen. I believe in one God and the security and comfort of faith. In my journey towards women’s rights, I have used my curiosity and love for Islam to understand how customs that the Prophet Muhammad PBUH abhorred became normalized and re-justified by using improper interpretations of Islam. In fact, women’s equality was very important in Islam from the very beginning. The Prophet’s first wife was a very successful and powerful businesswoman, much older than he, who believed in him before anyone else did. The Prophet valued intellectual relationships with the women around him. And God taught in the Holy Quran that women are to walk shoulder to shoulder with men. There are many stories in Islam dedicated to important women throughout the ages. And so we use these lessons and stories, which are mostly unknown in communities where understanding of the Holy Quran is limited to the recitation of the book in Arabic, a language unknown to them. I share about how we use Islamic teachings to fight honor killings and the overall role of Islam in women’s leadership and empowerment. In 2011, after working tirelessly for my women and later serving families displaced by epic flooding in Sindh province, I collapsed in a puddle of convulsions. The doctor’s would later tell me that I had a stroke and warned that if I did not stop I would continue to suffer from dangerous seizures. I was only 21 years old. And I couldn’t stop. I had to stop the abuse I saw all around me. So, believing that I would die, I decided that I had to find a way to bring more impact more quickly. That is when I decided to start telling my story to the world. Along the way I realized that it was foolish to think that I could change so much without being alive to see it through. In order to be effective in reaching my goals, I realized, I had to take care of myself. It was my stroke that taught me about balance; how it is just as important to rest as it is to work. I share my story of how I fought hard to go back to my work and how my physical body forced me to change the way I approach challenges. At the age of 16, I started my journey with no experience, no wealth, poor health and no power. I only knew how to tell my story. That led to the change in lives of hundreds of women in Pakistan and inspiration to thousands around the world. I talk about how to tell your story, how to use social media, writing, speaking, and other platforms to be vulnerable and touch human hearts. My uncle killed my cousin at the age of 14 because she fell in love with someone. I hated him. I hated my father and my brother, and every man in the world. I lived in rage, trauma, hatred and sadness for many years until one day I learnt to forgive. It didn’t come easy and it nearly broke me, but what came after was tremendous success in my work. I took a huge barrier that was holding me back and I threw it away. And because I did that I was able to walk further and do this work more effectively. First you must forgive yourself, and then every person who is holding you back. Forgiveness is the real courage. It’s the first step towards real change. The biggest reason honor killings still exist is because the definition of honor in tribal areas focuses on where women go, who they see, who they talk to, etc. In short, honor is most concerned with the sequestering of one's women--daughters, sisters, wives. 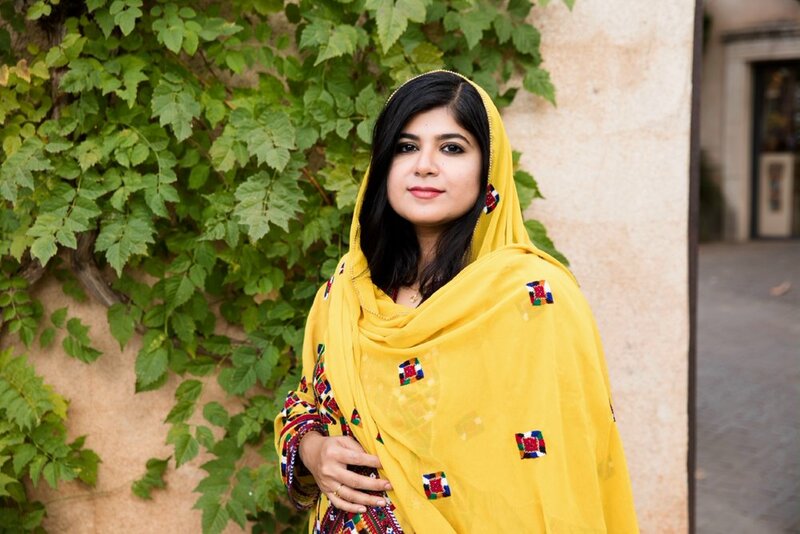 The reason our projects have been so successful in fighting honor killings is because we have been able to shift the focus of honor from disempowering women to preserving our tribal identities. When my husband David and I fell in love, we shocked both of our families. My tribal family back home could not believe it. I was the first ever to share about my love after my cousin’s murder. And David’s family could not believe it because, not only did I come from Pakistan, but I also fought honor killings of women. I share the journey of bringing these families together, across continents, cultures, and faiths, and in the process discovering ways to build bridges across nations. Today, we run two companies that touch the hearts of people every single day, and we share the message of building bridges. I share in my talks about the power of diversity and unity coming together. At the heart of our success at Sughar is the Sughar model. One aspect of it is the Sughar Hub model, which includes establishing a building in the center of a tribal village with a bathroom, plenty of natural light, solar panels for electricity, a water tank for drinking water, and enough room to seat about a hundred people. At these Sughar Hubs we invite several organizations to engage the community on a broad range of useful events and trainings so that they can all work together with one community. So if one organization is providing training to women, another organization helps in providing a market to use that skill. If one organization is providing young people of that village with an exposure visit to some businesses in a second province, the other organization can then provide them grants to launch their own businesses. Hence by creating these Hubs for our own trainings we are at the same time creating a hub of solutions to many of their local problems.